Still kind of working on my Smallrig layout and I decided to go with one of their “Safety rails” for the top handle. The little quick release spring numb makes me feel a little safer about handing it off to others and prevents the top handle from sliding completely if I bump the thumbscrew. The Safety rail is slightly longer than the NATO rail I bought originally and it’s missing the 1/4 20 mounts up and down the center, but I don’t think that’ll be much of a problem. I originally thought I’d be using those mounts every once in awhile, but I think with a monitor and a handle I pretty much have everything I need. If I need to mount a friction arm, I can always use one of the many 1/4 20 threads on the top of the unit. My build is still evolving, but I’d like to thank everyone for sharing pictures of their set ups and design ideas. If you have any other ideas to make this design more useful, feel free to send me some pictures or post links. I’ll take a look at them. 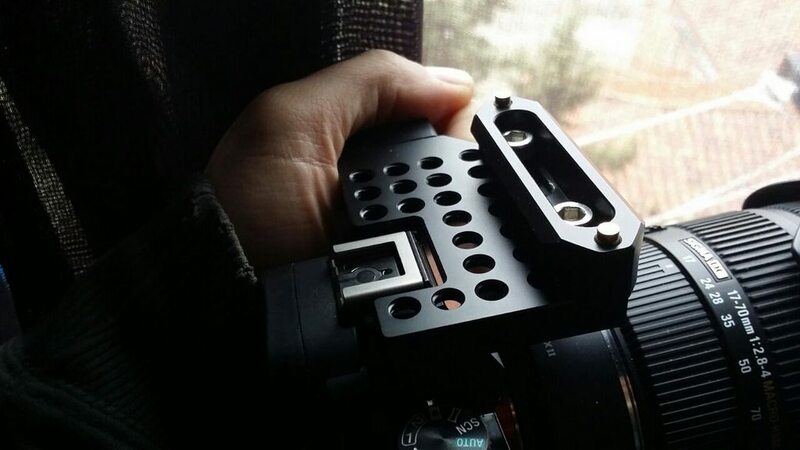 With everyone working on this we can probably come up with the a perfect Smallrig parts list for the Sony a7s. Those little brass safety nubs at the ends are fantastic. It reduces the chances of the whole camera sliding off when removing the handle. I agree. They seem to be well worth the price. My nato rail is the shortest available, but I have to reconfigure the rig because the rail with the handle on the front interferes with the XLR k2m adapter. I don’t have the audio adapter yet, I’m waiting for the 28-135 f4 for buy the adapter, but now I have to choose between the handle or the audio adapter.